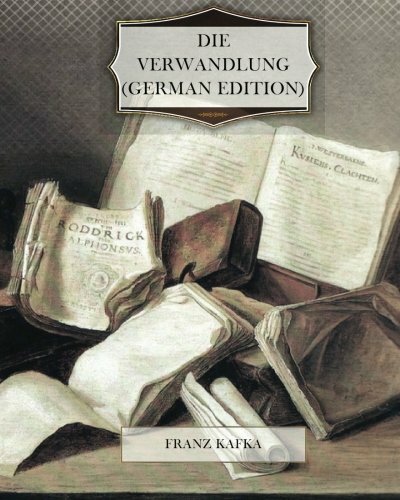 Die Verwandlung (in English, The Metamorphosis) by Franz Kafka, while an easy read in English, was very, very difficult for me in German. As I mentioned in an earlier post, I'm not fluent in German, but am trying to improve my reading. The story is one that probably most of us are familiar with from high school. Gregor Samsa wakes up one morning to find that he has changed overnight into a giant cockroach. I've always enjoyed this book, because of its deadpan approach to a bizarre situation. Kafka wrote that he wanted it to have the quality of a dream, and that's precisely what it has. In dreams, the bizarre is calmly accepted, and its ramifications play out in silly ways. In the book, neither Gregor nor his family is remotely surprised that he is now a giant insect, but they all make adjustments, small and large, to deal with the new situation. Gregor learns to get all of his many tiny legs under control and going in the same direction. The loss of Gregor's income is dealt with, as is the rearrangement of his room to make crawling and hiding easier. His sister, through trial and error, figures out what he now prefers to eat (spoiled food and wilted vegetables, in case you're wondering), and puts it on a tray on his floor every day. As with other readings in German, the problem for me with this one boils down to vocabulary. Last summer I did some intensive vocabulary work with index cards, and it was really helpful. I'm thinking I should do that again--we'll be finished schooling at the end of this week, so maybe it's a good time. Reading a book in a second language is difficut and sometimes frustrating. Dutch is so easy to read now, but I would like to improve my French. It is language I love. The flash cards my be just a good way of improving the vocab espeially the conjucnctions, they really slow me down. For me it's verbs. So many different verbs in German start with just a few prefixes: ant-, ent-, an-, ein-, auf-, aus-.... Yeah. I just have to do the grunt work and build vocabulary. Following your example, I'll order a simple book in french tonight and get crackin'! I read Metamorphosis in English, but I can imagine the pain it must have been in German. I've only read Kafka's short stories in their original German; they are much easier to follow. I read a rare-ish short story of his called Das Urteil (The Judgment) and was totally happy when my German teacher apparently assumed I meant Der Prozess (the Trail) and praised me for reading an original Kafka novel! Priya, I'm so glad you "found" me here--I love getting knowledgeable suggestions on what to read. I have no one IRL who speaks German that I can consult with. I will look for the short stories, and please keep visiting and suggesting!